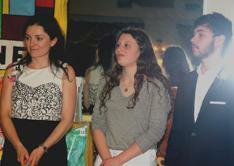 Three years ago Ms Simona Moldo­van brought One to One Learning to the attention of her students in the English Honor Society. Some responded to our need for teach­ers and so began a very life giving relationship between these volun­teers and students at One to One. 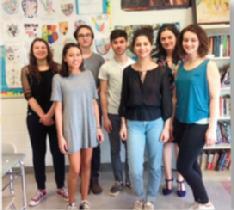 In the spring of 2014 five students from Nyack High School, Madeleine McCann, Dakota Peterson, Phoebe Holland, Lulu Sherman, and Sebastian Jukymin, began shadowing teachers and teaching in the small groups. They continued in September with groups of their own and completed the year. All moved on to graduate except for Phoebe Holland who was a junior. 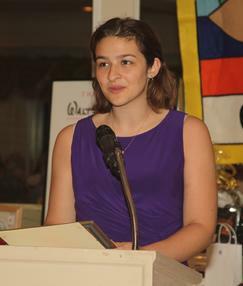 Phoebe took on the task of encouraging new volunteers when Ms Moldovan introduced the opportuni­ty. Samantha Cassanova and Jeremy Cairo took on the challenge and began shadowing and teaching in the spring of their sophomore year. Sophomores Eva Friedberg, Andrew Handrea, Hannah Curley, and Diana Juechter began in this spring semester and will continue into the next year. And so the cycle continues. We hope with the help of Ms Moldovan and present par­ticipants the relationship will prosper. Phoebe Holland has already promised to return during college breaks. The enthusiasm of these fine volun­teers brings life. Students respond to their energy and dedication. They really care about their students. Their attendance is very good; some may excuse themselves when school work demands it. This is not often the case. One to One Learning proudly honors the Nyack High School English Honor Society and Ms Simona Moldovan with the 2016 Youth Award for providing dedicated present and future young teachers to our organization.